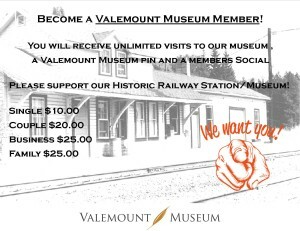 A membership is a great way to support the Valemount Museum and Valemount Historic Society! Members enjoy unlimited visits to the Museum at no additional charge, receive a museum lapel pin, and additional members-only benefits. We accept payments online through PayPal, or stop by the Museum during business hours and pay with cash. We look forward to your visit! * This will take you to PayPal to complete the transaction.